Known for its unique, savory taste, asparagus is a highly nutritious vegetable that is a must-have for anyone looking to improve their diet. Asparagus sports numerous nutrients and low calories, and is amazingly versatile in the number of dishes it can be used in. Read on to learn all about the benefits of this spectacular pinecone-on-a-stick. Pregnant women take folic acid, a B-vitamin also known as folate, to reduce their risk of having a miscarriage. Folate also helps protect the fetus from developing neural tube defects as it grows. The 17% folate in asparagus makes the vegetable one of the top natural sources of the vitamin and is highly useful during any period of rapid growth. Homocysteine is an amino acid that’s been associated with blood vessel inflammation and is a risk factor for coronary artery disease. Those with high homocysteine levels are almost three times more likely to suffer a stroke and almost twice as prone to developing heart disease. Certain B-vitamins, like folate, help break down homocysteine and can reduce this risk. Additionally, homocysteine can interfere with serotonin, dopamine, and norepinephrine production in the brain and possibly affect mood and depression. The insoluble fiber in asparagus can’t be digested by the body and absorb water along its travel through the body. In the bowel, it acts as a bulking agent to stool by providing both mass and water to increase softness and size—both elements that help stool get passed. Proper fiber intake ensures regularity and ease of bowel movements, ensuring regular expulsion of various toxins and waste. Low vitamin K is associated with a higher risk of bone fractures and osteoporosis, but fortunately asparagus has 70% of your daily need. Vitamin K also helps the body absorb and process calcium, preventing it from getting lost through urination. Asparagus also contains iron, which helps maintain the elasticity and strength of joints. While you can easily mix some bits of asparagus into an omelet or steam some stalks to have with your dinner, an even better idea is to try some of these delectable recipes to really boost your asparagus consumption. 1. Trim rough ends from asparagus; discard. 2. Cut off asparagus tips and reserve. 3. Cut stalks into 3/4 inch-long pieces. 4. Place 2/3 of celery stalks, one cup of broth, and one cup of water and mix in the blender. Puree until it reaches a smooth consistency; set aside. 5. In a large saucepan, melt butter over medium heat. Add in the onion and sauté until tender—this should take about eight minutes. 6. Add rice and stir one minute. 7. Add wine, cook, and stir for about two minutes. 8. Add rosemary and 1/2 cup of broth, simmer and stir for about four minutes. Cook for another 15 minutes (continue to add broth by half cupful—make sure liquid is absorbed before adding the next half cupful). Stir often. 9. Add reserved asparagus stalk pieces and reserved asparagus tips and continue cooking until rice is just tender and mixture is creamy; continue adding broth as needed and stir often, about 10 minutes longer. 10. Add reserved asparagus puree and stir until absorbed, about three minutes. Stir in 1/2 cup of parmesan and cream. Season to taste with salt and pepper. 11. Transfer risotto to bowl. 12. Garnish with rosemary sprigs, if desired. 13. Serve, passing remaining Parmesan separately. 1. Before you begin, preheat the oven to 375 degrees Fahrenheit. 2. Cut off the ends of the asparagus. 3. Unwrap the phyllo and cut the stack in half (make sure it is cut lengthwise). Reserve one stack for later use. Cover the phyllo with a damp towel to keep it from drying out. 4. Take one sheet of phyllo and brush lightly with some melted butter. Sprinkle with parmesan. 5. Place two to three asparagus spears on the short end of the sheet. Roll up, jelly-roll style. 6. Place each piece, seam side down, on a baking sheet. Brush with more melted butter and sprinkle with more Parmesan. Repeat until all the asparagus spears are used up. 7. Place the baking sheet in the oven and bake for 15 to 18 minutes, or until golden brown and crispy. 1. Place breast between two sheets of wax paper and gently pound with the side of a glass until it is at least 1 1/2 times its original size. 2. Lay a few strings of the cheese across the center of the breast and then place asparagus tips on the cheese. Lay a few more strings of cheese over the asparagus. 3. Roll the chicken breast up around the cheese and asparagus. You can skewer the ends with a toothpick—just remember to pull it out before serving. 4. Lay remaining cheese strings in a crisscross pattern across the top. Sprinkle with herbs and spices. 5. Lightly spray baking dish with olive oil and place the stuffed breast in the center of the dish. Bake at 350 degrees Fahrenheit for about 40 minutes. Serve with a side salad and enjoy! “Asparagus Risotto,” Food.com; http://www.food.com/recipe/asparagus-risotto-37801, last accessed September 24, 2015. “Asparagus Stuffed Chicken Breasts,” Food.com; http://www.food.com/recipe/asparagus-stuffed-chicken-breasts-520427, last accessed September 24, 2015. “Phyllo Wrapped Asparagus,” Food.com; http://www.food.com/recipe/phyllo-wrapped-asparagus-184523, last accessed September 24, 2015. “National Nutrient Database for Standard Reference,” United States Department of Agriculture Agricultural Research Service web site; http://ndb.nal.usda.gov/ndb/foods/show/2861, last accessed September 24, 2015. 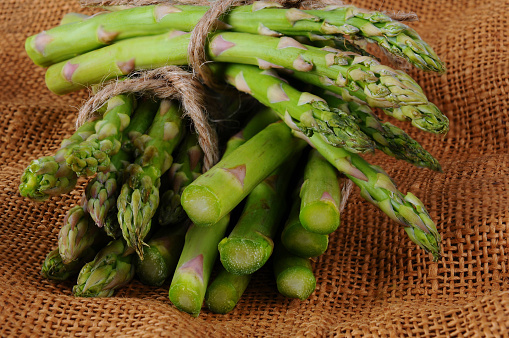 Ware, M. “What are the health benefits of asparagus?” Medical News Today web site, April 8, 2015; http://www.medicalnewstoday.com/articles/270805.php.